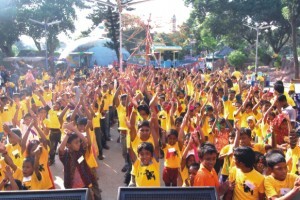 Street children gather at Wonderland. A few weeks ago, a group of young boys and girls, clad in bright yellow tees, were seen thronging the roads in different parts of Dhaka city, selling flowers at red signals and talking to people in the vehicles. Not only was it a shock for commuters sitting in the traffic jam watching these young people in yellow Jaago Foundation tee shirts selling flowers, it was quite a pleasant surprise for them to watch these smiling youngsters trying to make a difference in their own little way. 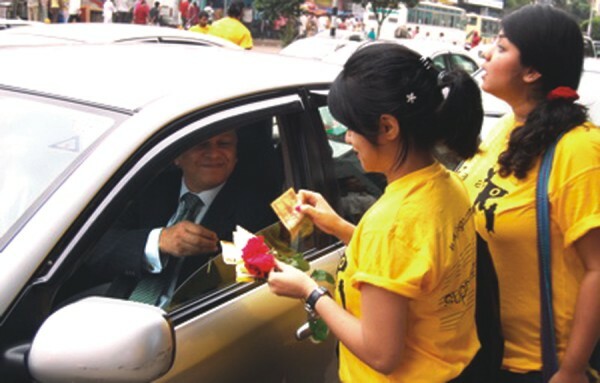 Volunteers selling flowers on the streets. According to Korvi, the other purpose of this campaign was to collect the children who sold flowers and other goods at the traffic signals, and let them take a break from their daily job at trying to sell something. Several volunteers, students and employees from JAAGO Foundation got together on the day to sell flowers, popcorn, toys, etc. on behalf of the street children to raise funds. “The street children were on leave that day!” says Korvi. “We also took them to Wonderland, where they relaxed and had fun for a change.” The money that the volunteers earned, instead of the children that day, were divided equally amongst the children in each section of the city. The day had begun with feeding around 500 street children in Wonderland. After the breakfast, the children roamed about, exploring the fun rides. The Wonderland authorities allowed the children to hop onto the rides for free for three hours. For Lipi, one of the street children, it was a day she says she will not forget. “I really like the Bumping Car and I am going to go there again!” she says. After the rides, a magician appeared on the stage and mesmerised the children with his tricks. At around 1:00 p.m., the volunteers served lunch to the children. “Thanks to Novartis Bangladesh Ltd, we even had a health camp where the children had a medical check-up,” says Korvi. “Many well-known personalities had come to support this event such as Akku Chowdhury, the executive director of Transcom Food Ltd, eminent television personality Hasan Imam and several young artists and musicians.” The event was also supported by The Daily Star, Mojo, KFC, Pizza Hut, Adcomm, Radio Today and the Alliance Group. Armeen Musa, a young musician of the country, was also seen selling flowers in one of the streets in Dhaka. “Many celebrities and well-known personalities stood at the Gulshan-2 junction from 3:00 to 5:00 p.m. and worked as volunteers,” says Korvi. The volunteers from JAAGO Foundation earned around 3 lakh takas from the campaign, which was then divided among the children. Korvi Rakshand selling flowers with his fellow helper. In the middle of a medical check up . Relaxing after a fun filled day.